The search for the fountain of youth has been ongoing ever since man decided that dying wasn’t all that appealing. And now, it appears that this elusive holy grail has been found, albeit by a species that is not ours! So who is the lucky winner of the everlasting life sweepstakes? None other than the humble and dime-sized jellyfish known as Turritopsis nutricula. This creature has accomplished what no other biological being on our planet has ever been known to do: reverse it’s aging to become young again after reaching full maturity! As early as 1992, scientists had observed this phenomenon in Turritopsis and research into its secrets was ongoing. However, a recent spike in the numbers and geographic distribution of this species has once again brought it to the attention of the greater scientific community because of the many important breakthroughs we have witnessed in stem cell research in the past decade. 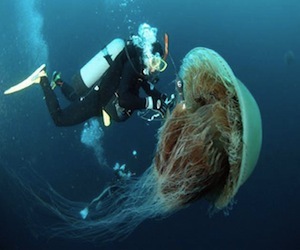 As regenerative medicine continues to grow into the future of medicine, it’s clear that this tiny jellyfish may hold the answers to not only addressing the many aging-related ailments we face, but also our own mortality! via Immortal Jellyfish Provides Clues for Regenerative Medicine | Singularity Hub.